A returning customer, Melissa, requested a Custom Military Deployment Bracelet (B202), in honor of her husband who was going to be deployed towards the end of the year. All Melissa requested was that it have yellow in it, she gave me carte blanche to work my artisan magic and CrystalAllure-ize a beautiful and memorable design for this very special beaded bracelet. The final design was the third go at it. Although I was inspired by the first two ideas, it was the last that I actually had a dream about and that is the one I went with. This beautiful handmade awareness beaded bracelet was given even more meaning with a personalized, hand stamped initial charm. 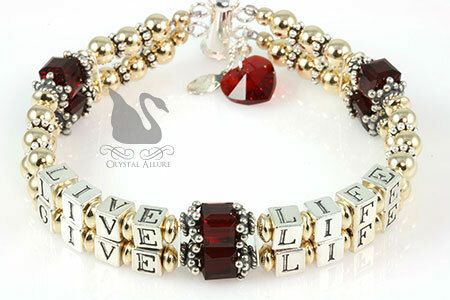 The design was created to complement her Custom Crystal HPV Awareness Bracelet (B194-HPV) previously purchased from Crystal Allure. The feature and focal of this design is the beaded strand of yellow Swarovski Crystals, yellow agate and glass beads centered between two sterling silver American flag block beads. To keep the focus on the message of the bracelet, the remainder of the design was kept subdued and finished with three charms, an awareness ribbon charm, a custom hand stamped initial charm and our signature jewelry tag. It was my pleasure and honor to have been selected by Melissa to create this beautiful keepsake treasure. I wish for Melissa a speedy return of her husband from active duty. And I personally thank her husband, Troy, and all the troops serving for their dedication in protecting us and our freedoms! Remember I've said this before? Well, tonight I spoke with a customer who had recently ordered our Cystic Fibrosis Awareness Bracelet (B166) -and I just had to share this conversation with you. When this customer, Frances, placed her order, I received my typical receipts through PayPal. Except, her payment receipt came from a different email address than what was listed on the store web order. But, I didn't think anything of it because I have received those before. A lot of times, people use a different email for PayPal purchases than what they use for regular communications. Ironically, tonight, I happened to ship Frances' order. I get home and had a message on voicemail. It was Frances. Her message said she was calling to check on the order she placed because she received a call from a stranger saying he had received an email receipt that he purchased something (but it showed her mailing address). So, I log onto both my online store and PayPal account -everything looks in order -except the fact that this other persons email is somehow associated with my customers' PayPal account. I give Frances a call and check whether she logged into PayPal or just paid with a credit card. She clarifies that she had logged into her account, but what she proceeds to tell me next, is just too beautiful not to share. She reiterates that she received a call from this stranger, who identified himself and tells her he received an email that said he purchased this bracelet but showed her mailing address. France tells him she doesn't know why that is but that she will call the company (Crystal Allure Jewelry) and check things out. She is about to say goodbye and this gentleman says, "The weather down here in Texas is...how's the weather up in New Jersey?" This small inquiry begins a conversation between the two. Frances shares that she recently lost her mother (to Alzheimer's) and this gentleman replies that his wife is in the end stages of her life....and she too is dying of Alzheimer's. They converse for a short time longer and before hanging up, this gentleman tells her, "If for some reason this bracelet is charged to me but gets shipped to you -do not send me the money for it. You keep it as a gift from me." 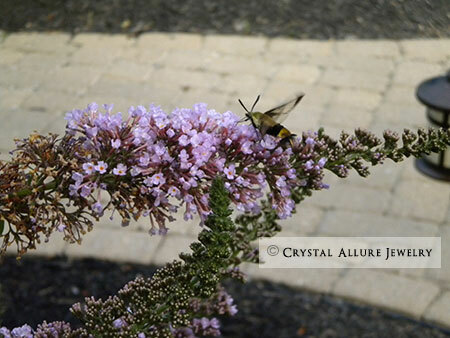 At that point, there was a pause in our conversation and during the brief pause, I connected all the 'ironies' that have occurred with the simple act of Frances placing an order with Crystal Allure Beaded Jewelry Designs. I was in awe. I was inspired. My heart was filled. I felt good and I felt connected to both these individuals. I then spoke and I told Frances, "From what I can tell, everything with your order is okay except for this email mixup. I can't explain why PayPal tied this email with your account but I can say, I believe everything happens for a reason and you two were meant to speak to each other." It fills my heart to know a simple jewelry purchase has connected together these two people. Before we hang up, Frances tells me to 'pass it on' (this story). After speaking with Frances tonight, our conversation 're-framed' my perspective of the day and has even inspired a new handmade beaded bracelet design (stay tuned for the design announcement). I hope after reading this, you will remember this story when the coming holidays get stressful; you're having to deal with hectic and hurried holiday shoppers; you're having a bad day at work; feeling a financial pinch or feeling a deep emotional loss. And believe -everything happens for a reason. When autumn rolls around, it's time to start pulling out the heavier sweaters, coats and clothes. But, just because the cooler air causes a layering of clothes doesn't mean you have to sacrifice your style. Add one of our new bold Fall Beaded Jewelry Necklaces to stand out from the crowd. 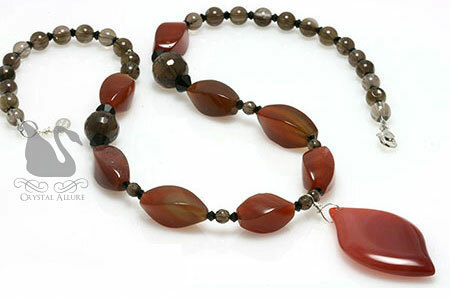 A beautiful strand of glowing warm reddish-brown red agate gemstones and subtle, sensual smoky quartz gemstones, accented by jet black Swarovski Crystals, feature an asymmetrical twist style red agate gemstone pendant in this handcrafted beaded necklace. Sterling silver. Design finished with our signature jewelry tag. Beaded Necklace measures 18-3/4". A beautiful strand of scattered gemstones, wood beads and crystals are featured in this handcrafted beaded necklace. The chinese unakite gemstone circle pendant is a blend of greens and reds reminiscent of autumn's pleasures and complements beautifully with the autumn jasper's rich tones of fall. Imagine pumpkins, red maple leaves, and leisurely walks in autumn. That's the earthy look and feel of the warm brick red and avocado green colors of autumn jasper. 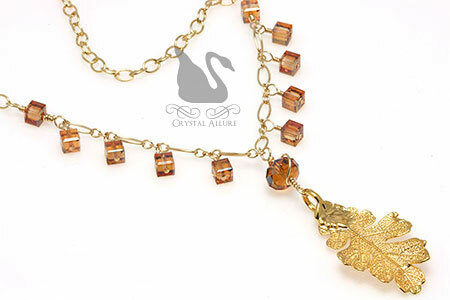 To add to this earthy fall design natural dark wood beads, amber gemstones, red aventurine gemstone and evergreen Swarovski Crystals are paired with sterling silver. Finished with our signature jewelry tag. 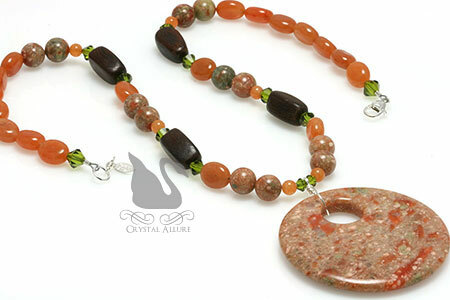 Beaded Necklace measures 17-1/2" with a Gemstone Circle Pendant measuring 45mm. A beautiful earthly yellow jade gemstone teardrop pendant is host to natural wood beads, aventurine gemstone accent beads and 14k gold fill beads in this handcrafted beaded necklace. Finished with a 14k gold fill heart lobster clasp and our signature jewelry tag. Beaded Necklace measures 17-1/2". Last week, Crystal Allure Beaded Jewelry Designs participated in an annual jewelry show, in support of the United Way through Ortho-Clinical Diagnostics (Johnson and Johnson). 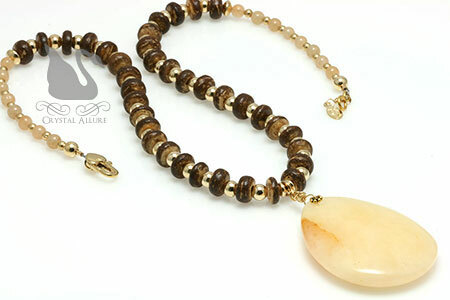 One of our favorite customers, Liz, stopped down and purchased the Smoky Quartz Gemstone Bali Beaded Bracelet (B147). Liz was drawn to this beaded bracelet because of its' unique off-center design technique. She loved it so much that she wore it that day and is still wearing it. 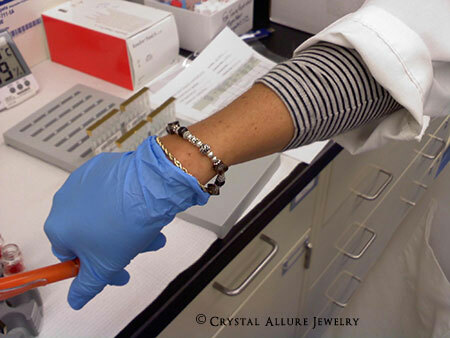 Liz works in a lab and was kind enough to send a picture of her wearing her beautiful handcrafted beaded bracelet. It matters not where you work or what work you do -our unique handcrafted jewelry redefines your femininity. A touch of country with a bit of sass -all rolled up in one handmade beaded bracelet. This design takes you just off the beatin' path with an off-center design technique. 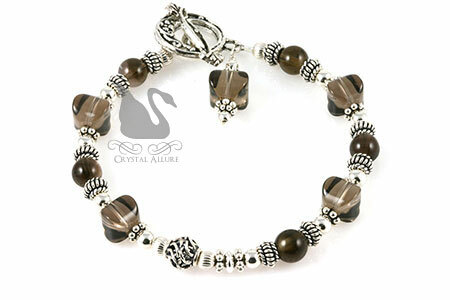 A gemstone bracelet for the woman who likes to add a little uniqueness to her style featuring both round and lantern-shaped smoky quartz gemstones accented with sterling silver beads, .925 Bali and a silver Bali style toggle clasp. Measures 7-1/2". 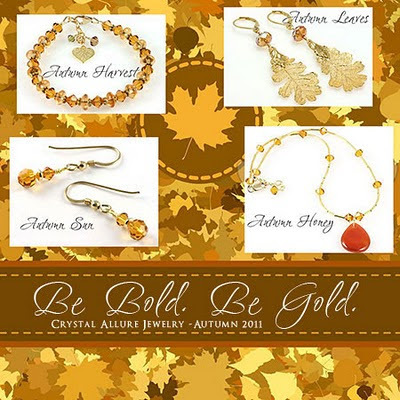 Crystal Allure Jewelry -Beautiful. Feminine. Alluring. Yvonne had been searching a long time for the perfect ruby red Sacred Heart wedding jewelry set for her upcoming wedding. It was September 16th and her wedding was just 2 weeks away on September 30, 2011. She contacted me because she fell in love with the Freshwater Pearl Red Crystal Heart Beaded Necklace Jewelry set (NES4) and was worried, if she purchased it, would it arrive in time for her nuptials. My response? No problem! I immediately got this bridal jewelry set in the mail to her in time for her destination wedding. This beautiful handcrafted beaded necklace and earrings jewelry set features a stunning combination of Freshwater Pearls and red Swarovski Austrian Crystals with Crystal Heart Pendant. 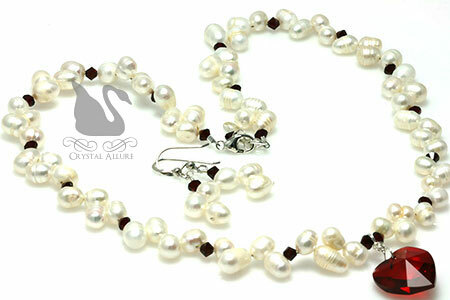 The perfect set for the unique bride -a great gift for your sweetheart on Valentine's Day -or simply just because! Ear wires, beads and components are all sterling silver. 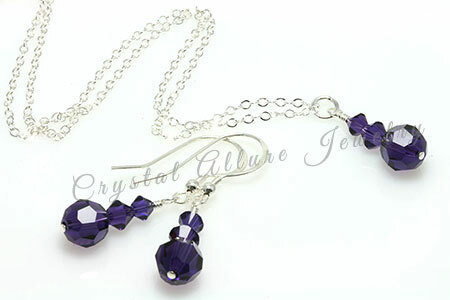 Necklace measures 18"; earrings measure 1" from the bottom of the ear wire. In mid-April Christina contacted me requesting a custom addison's disease awareness bracelet. She saw and loved our Guardian Angel Caregiver Awareness Bracelet (B196) but wanted to have it customized. The nationally recognized ribbon color for Addison's Disease, a rare, chronic endocrine disorder, is light blue. Christina really loved our caregiver beaded bracelet so much that we kept with that design and customized it with her awareness color, light blue Swarovski Crystals. I replaced the guardian angel charm with a sterling awareness ribbon charm and added a Swarovski Crystal dangle charm for an added feminine touch. What makes this beaded bracelet and design even more special is the fact that the Swarovski Pearls just happen to also be the birthstone of the gift recipient! I just received my bracelets today and I wanted to let you know how much I loved them. I am keeping one of them for me and the other one I am giving to my niece who is 19 years old. She was diagnosed with Addisons Disease two years ago. We almost lost her. She was in the hospital for 3 weeks in an induce comma. Know one could figure out what was wrong. It was not until a doctor came in and asked my sister and brother in-law if Charlotte went to a tanning booth. They said no, and at that point he knew she had Addison. That is one of the symptoms that your skin is tan all over. I am going to give this bracelet to Charlotte in June for her birthday. What makes it even more perfect is that her birthstone is pearl. Thank you for your time in making this a perfect gift. You are very welcome! 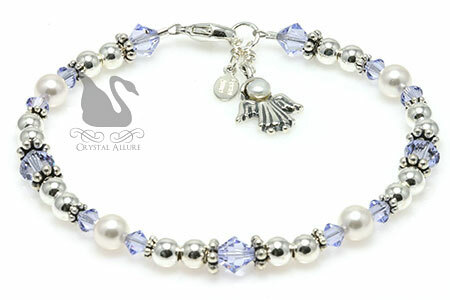 It was my honor to design this special bracelet for Christina and her neice, Charlotte -enjoy! I was away this weekend and came home last night to the bracelets!!! They are so beautiful!! I'm seeing my family this weekend, so I can't wait to give them out! Thank you sooo much for making this a very memorable experience!! I will definitely log in later to your site to add a comment to let others know what great work you do and what fantastic service you provide! I know I will be back for other purchases, particularly your awareness items! Thanks so much, Stephanie-you're a keeper! I can't tell you HOW MUCH we love our bracelets from Stephanie! She not only gives #1 customer service, but she has a great skill set that is being used for worthy causes. 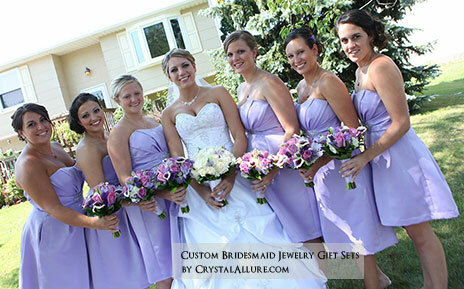 All the girls in my family each owns a Pulmonary Fibrosis Awareness bracelet (from Crystal Allure Jewelry). It's such a pretty bracelet, and I get compliments often. When I tell people it's an awareness bracelet, they love it even more! Every morning when I put it on, it reminds me to give my Mom a shout out that I still think of her EVERY DAY! Thank you Stephanie for creating something that is pretty as well as instrumental in making sure we never forget the precious things in life. You are very welcome Susan! I am so glad you love your PF Awareness Bracelets and that you chose Crystal Allure Jewelry for your beaded awareness jewelry! Enjoy and I look forward to working with you again! Back in July, Matia, contacted me to design a custom Behcet's Disease awareness anklet. Her only request was to somehow include the word "hope". I got to work, first, on learning about behcet's disease. I had not heard of it before and I feel the more I know about a particular disease the more it inspires my designs. It's also important to me to learn what and how these diseases affect those very special people who come to Crystal Allure Jewelry with a custom beaded jewelry request. Read more about behcet's disease below. 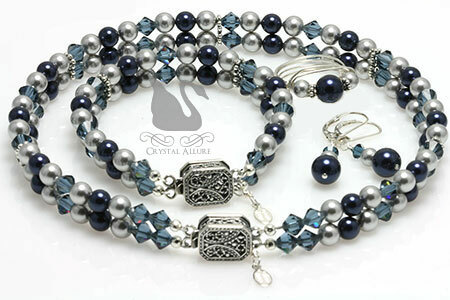 The design uses the nationally recognized light blue color for behcet's disease in Swarovski Crystals, accented with sterling silver beads, bali spacers, small awareness ribbon bead and pearl white seed beads. 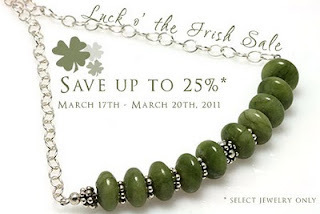 The feature of this beautiful, feminine design is the personalized hand stamped HOPE charm. The anklet is amazing! It is so much more beautiful in person. Thank you so much! I think it is gorgeous! I love the picture!! I can't wait to get it...thanks so much. I'm going to tell the people on the Behcet's web group all about it. Behcet's disease is an autoimmune disease that results from damage to blood vessels throughout the body, particularly veins. Most symptoms of the disease are caused by vasculitis (an inflammation of the blood vessels). Behcet's disease is not contagious; it is not spread from one person to another. Behcet's disease affects each person differently. To learn more, visit the official Behcet's Disease website. One of my sweet customers, Beverly, contacted me to see if she could get a coordinating pair of earrings designed for the Organ Transplant Awareness BREATHE Bracelet (B195) that she was planning on purchasing. While on the phone she asked if it was possible to also have a pair of beaded earrings designed to go with the bracelet she had already purchased, the Transplant Awareness Ribbons Bracelet (B105). 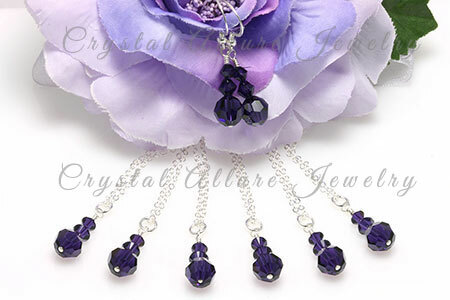 Of course, I was more than happy to custom design these crystal awareness beaded earrings for her! On the day we spoke, I just happened to be having a not so great day (you know how it goes..Murphy's law..). Well, I sent her a photo showing four sample pairs of earring design options and in her reply she said, "I would have never known that you were having a bad day, you were so pleasant and kind to talk to." A few other kind comments she made included: "you are very good to your customers", "you are just as beautiful as your jewelry is..", "I love your jewelry and will wear them with much pride..", "I am so happy thanks to you! ", "you are an awesome person and so very very kind" and, "the meaning behind your awareness jewelry is so beautiful and so true!". I am sharing all these comments with you because I am always so very grateful for each and every comment a customer sends me. 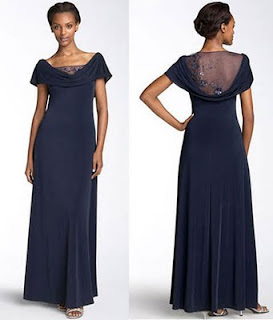 Your comments guide me on how well (or maybe not so well) I am conducting business, as well as, how well received and meaningful my designs are. I received my awesome jewelry in the mail yesterday afternoon and I just absolutely love them all! You truly did a super job on coming up with the idea of your jewelry. It's all so gorgeous and the charms on the bracelet are so adorable. 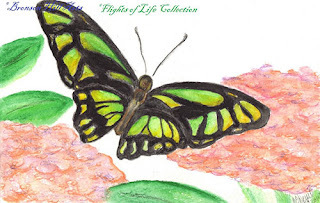 I love the meaning of the butterfly, what a beautiful way to express the new lungs taking their first breath. 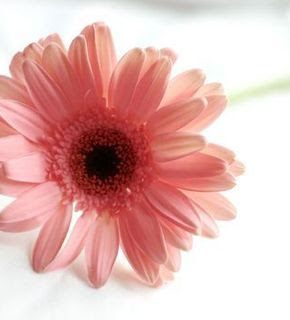 Hugs and kisses to you and may God Bless you always! You are very welcome Beverly! And thank you for your continued business. 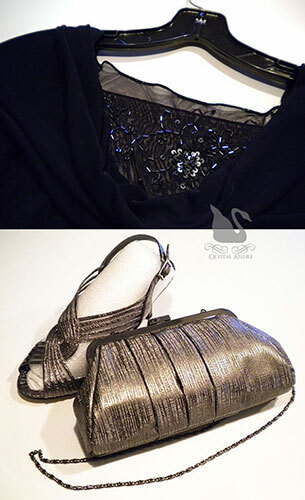 Enjoy your new designer jewelry! This was not the planned blog post for today, but once I read about a contest to win one, I simply couldn't resist sharing. What girl does not have a personal (ok, border-line, downright, freaky) attachment to her purse/bag?! Come on now, admit it...you know you do! Today, I was introduced to Kelly Moore Bags through the SITS blog and fell in love with the purple classic bag design (it's SO mine!). Kelly Moore bags are perfect for carrying your camera and accessories -but with a Kelly Moore bag, you do it in style! I've had my Canon Rebel camera, oh, 3 years? And have yet to get a bag to carry it in, mainly because all the bags available looked so...well...blah. 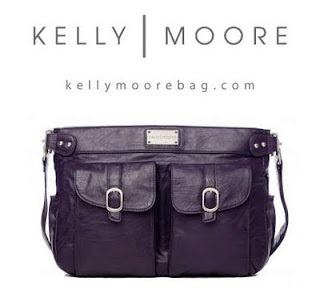 What I also think is so fab about a Kelly Moore classic bag, are the two front pockets which I'm sure will fit my new IPhone (when I get it...yes, the official count down to "I can finally upgrade my phone to an IPhone" has begun...only 39 more days). on a side note: all this hype for getting an IPhone leaves little room for disappointment, right?! So, I will now add a Kelly Moore purple classic bag to my wishlist (Christmas in July, did you say?!). But first, I think I'll try to win it by entering the contest over at the SITS Girls Blog. Head on over for your chance to win one FREE! If you win, come back and let me know what bag you chose. Good luck!